Like many teenagers, I kept a diary. In flowery prose I bemoaned my unrequited love for an older married man. I cherished leftist views of the world and a bombastic philosophy to match. I saw myself as a useless bystander of a life that was slipping past. There was nothing very special about my diary except for the circumstances under which I wrote it. I was Jewish, and during the two years that I kept the diary, I was hiding in Nazi-occupied Belgium to avoid deportation during World War II. My cover was being a mother’s helper and governess to three families with small children. I was young and foolish enough to minimize the danger I was in, and took all kinds of chances of being unmasked. It was probably was my self-assuredness and nerve that helped me slip through German patrols and other traps. I ignored my diary for decades. When I finally reread it, it offered me a glimpse of the teen I had been. It also offered vignettes of wartime’s daily drudgery, the fears, the nightmares, food shortages, the loss of friends, and what it means to have been torn from a warm home to live with strangers. I vividly recalled how ineffectual I felt at just saving my own skin and how I hated to be a burden and a danger to those who sheltered me. My entries could not stand on their own, so the grown woman, now safely ensconced in America, supplied the narrative that turned the diary into a comprehensive book called: At the Mercy of Strangers: Growing Up on the Edge of the Holocaust. Once published, books take on a life of their own. My granddaughter Naomi teaches young and not so young adults who, for a variety of reasons, have fallen off education’s straight and narrow path, and now prepare to take their high school equivalency exam. She sometimes invites me to talk to her classes at the Turning Point Education Center. Her students confronted poor schools, English as a second language, personality disorders, dysfunctional homes, or learning disorders and probably feel as sidelined by society as I did. Though in retrospect, I considered myself an ineffectual teenager, waiting for the war to be over so that I could try to catch up with my life and my education, my readers see me as someone who succeeded in spite of incredible obstacles. 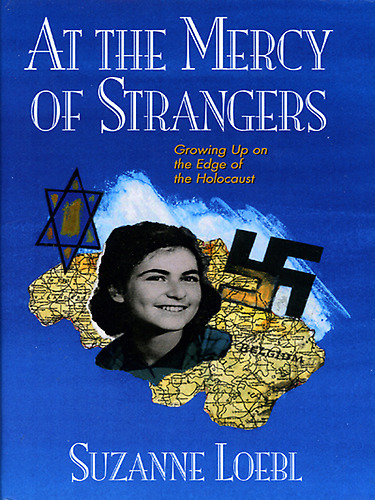 Suzanne Loebl’s memoir, At the Mercy of Strangers: Growing Up on the Edge of the Holocaust, is available in hardcover and e-book from Amazon.com and bookstores near you. For signed copies visit www.SuzanneLoebl.com. This entry was posted in Uncategorized and tagged adolescence, adult education, at the mercy of strangers, authors, german jews, hidden children, high school equivalency, holocaust, hse, john milton, judaism, memoir writing, memoirs, nazi germany, teenagers, teens, the writer's life, turning point, turning point education center, world war ii, writing, writing a book. Bookmark the permalink.